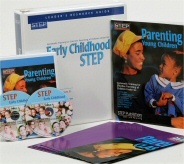 By Don Dinkmeyer, Sr., Gary D. McKay, James S. Dinkmeyer, Don Dinkmeyer, Jr.
Now you can help parents of young children raise cooperative, responsible, confident kids from the start. The program provides a framework for understanding young children’s ever changing needs, capabilities, development, and behavior. Discussions and activities make session times flexible - running between 1-2 hours each. For parents of children birth through 6. -Parenting Young Children (parent handbook order additional copies for each participant)(Product #K-216) order additional copies for each participant.